Dr. Jacques Galipeau is creating a multidisciplinary research team to push the envelope of cellular therapeutics. Self-repairing livers. A simple injection that regenerates osteoporosis-riddled bone. An end to diabetes, Parkinson’s and heart disease. Such notions smack of futuristic flights of fancy, but science fiction may soon become science fact, as a diverse group of McGill researchers discover how to use stem cells to restore, and even rebuild, the human body. Stem cells are the blank slate of the human body, a tabula rasa waiting to be transformed into any specialized cell: bone, nerves, blood, organs. Scribble on the slate in just the right way and voila! you can (theoretically) direct the cells to become a new pancreas, or lung tissue, or nerves. 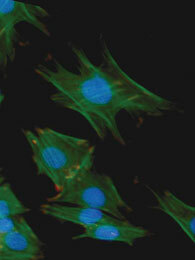 Marrow stromal cells can be harvested from a patient's blood, then used to grow new bones. The controversy over the use of embryonic stem cells (ESC), derived from fetal tissue, has hit headlines across the world, especially in the United States, where federally funded ESC research is prohibited. There is, however, another type of stem cell that holds the potential for tissue regeneration: Adult stem cells are getting a lot of attention and support from the global scientific community, Galipeau says, because they are derived from the patient’s own body, thereby avoiding the ethical issues plaguing ESC research. Adult stem cells are not as flexible as ESCs; unlike their embryonic counterparts, they can only transform into a cell within their family. A marrow stromal cell, for example, can become bone or cartilage, but not blood. But choose the right family of cell and you’re set to unlock a chest of seemingly miraculous cures. 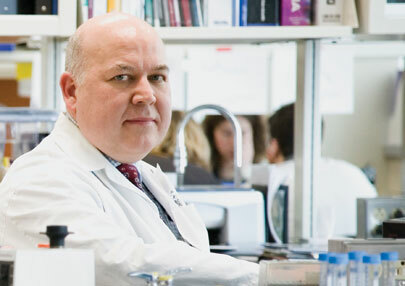 In early 2007, after nearly a decade of investigating cell therapy, Galipeau and his team at the Lady Davis Institute for Medical Research finally began their first clinical trial, only the nation’s second. The researchers used gene-enhanced adult stem cells to treat a patient suffering from pulmonary hypertension—a rare, often fatal disease affecting the lungs, for which a risky lung or combined heart and lung transplant is the only current cure. 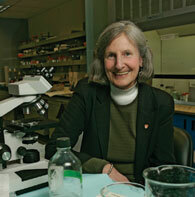 McGill researchers are interested in how nanoengineering can promote cellular healing. Jorge Viñals models the microstructure of materials. This unusual gene and stem cell therapeutic combination was developed in partnership with Dr. Duncan Stewart, Director of Cardiology at the University of Toronto—where, in November 2006, the world’s first human patient received treatment with this technology. 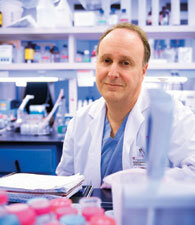 Galipeau believes that advances in regenerative medicine depend on setting up both outside and in-house collaborations. Because stem cell research is “the new kid on the block” and involves expertise and technologies scattered across the country, finding potential partners can be tricky. Galipeau credits Canada’s nationwide Stem Cell Network (SCN), one of 21 federal-government-funded Networks of Centres of Excellence, with building the partnerships that led to the current trials. Established in 2001, the SCN draws on the expertise of more than 70 leading scientists, physicians and engineers from universities and hospitals across the country. As leader of the SCN therapeutics group, Galipeau shepherds the teams trying to create treatments that target several now-incurable diseases (including stroke, Parkinson’s disease and blindness). “The strength behind the network lies in the fact that it is trying to move away from the paradigm of the solitary monk toiling away in his cell, towards a more multidisciplinary team approach to solving problems,” he says. Janet Henderson explores how specially designed bone surfaces can promote faster recovery from fractures. Now Galipeau hopes to create a local counterpart in the McGill Consortium. The MCSCR will not only perform basic investigative work, but will strive to bring the latest discoveries to patients as soon as possible. “We want to be forward thinking in putting in place a key enabling infrastructure to move as fast as we can to the clinic,” he adds. The drug has already successfully completed human safety trials, but the therapy won’t be ready for late- stage clinical trials for another couple of years. If this treatment does get off the ground within the next decade, it will have significant health and economic impacts. According to Rosenberg, 8 per cent of the Canadian population currently suffers from diabetes, with associated health care costs of $15 billion each year. “That’s for a disease that was supposed to have been cured by insulin,” he notes. Janet Henderson, Associate Dean of Research in the Faculty of Medicine, is trying to unlock the mystery surrounding how stem cells can help fight age-related diseases in bones and joints. According to Osteoporosis Canada, treating the 1.4 million Canadians suffering from the disease costs the country nearly $2 billion in direct costs. Henderson warns of a looming health care crisis that could cost billions more as baby boomers reach the age of highest risk for osteoporosis. “The demographics show that we’re on a trajectory where we’re simply not going to be able to manage this disease in 10 to 20 years time,” she says. Traditionally, doctors administer chemical growth factors (such as bone morphogenetic proteins) to help bone fractures heal faster in the elderly. However, Edward Harvey, one of Henderson’s collaborators, and Adam Hacking, a post-doctoral fellow, noticed that the actual surface texture of the broken bone had more of an effect on attracting stem cells and stimulating growth—but nobody had previously looked at why these cells seek out and repair the rough surfaces of broken bone. To understand what type of bone surface attracts these stem cells, Hacking is collaborating with Srikar Vengallatore, Canada Research Chair in Advanced Materials for Micro- and Nanosystems, to define the topography by examining how high and far apart the peaks or bumps are—in essence mapping out the landscape of the broken bone—then creating detailed replicas. Dr. Lawrence Rosenberg hopes that a new technique for reviving fading pancreatic cells may lead to a diabetes breakthrough. The microenvironment scale in which MIAM works is turning out to be the perfect match for stem cell research. Jorge Viñals, Professor of Physics and Director of MIAM, says that the scientists and engineers at the institute are keen on developing partnerships with other McGill departments. Projects on the MIAM drawing board range from building micro-sized cellular scaffolding on which stem cells can attach and multiply in order to help seal bone fractures, to engineering stem-cell-infused synthetic materials which can be surgically stitched into (or even entirely replace) damaged organs. “There is a growing awareness in both the scientific and medical communities that there is a clear overlap in what we do,” says Viñals, who notes that biologists are now focusing on the molecular scales that are the traditional playground of nanotechnologists. This research is funded by the Canadian Institutes of Health Research, the Canadian Diabetes Association, the Juvenile Diabetes Research Foundation, the Stem Cell Network and the Canadian Arthritis Network.